Iranian director Amir Naderi on Monday received the “Jaeger-LeCoultre Glory to the Filmmaker” award at the ongoing Venice Film Festival, for his significant contribution to a new era of Iranian films. A ceremony was held on Monday afternoon before the world premiere screening of his new film Monte, as reported by Xinhua. 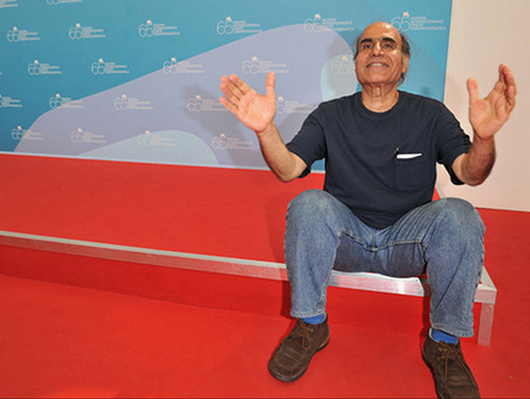 Born in 1946 in the southern Iranian city of Abadan, Naderi made his directorial debut with Goodbye Friend in 1971, and soon became one of the best known figures in Iranian cinema. “Naderi gave fundamental impetus to the birth of New Iranian Cinema during the 1970s and 80s, with a number of masterpieces destined to leave their mark on the history of cinema,” said Alberto Barbera, Director of the Venice Film Festival. “Every film he has made clearly displays the nucleus of an identical obsession which transcends the principle of reality in order to force individuals beyond their own limits,” Barbera added. Naderi’s new film Monte, screened out of competition at this year’s festival, is set in the year 1971, and tells the dramatic story of a man who makes every attempt to bring the sunlight into his village, where his family is barely able to survive because of the prevailing darkness. In 2014, Monte was one of the projects selected for the Venice Gap-Financing Market, a side-line program of the festival that offers filmmakers funding opportunities for the final production stage of their projects. The “Jaeger-LeCoultre Glory to the Filmmaker” award was established ten years ago to honour personalities who have made a significant contribution to contemporary cinema. Previous winners include Kitano Takeshi from Japan and Al Pacino from the United States.